First off, some unfinished business: when I covered Tarja Turunen's last album Colours In The Dark way back in 2013 when I was first starting my channel, I'm fairly certain I mangled the pronunciation several times over, so I'd like to extend my apologies for that. But truth be told, that's probably the most I actually remember about that review - or most of that album, if I'm being brutally honest. I know, it's been three years, but I haven't really been inclined to go back to Tarja's solo work, even compared to what she did with Nightwish. And I'm not sure why that is - going back to Colours In The Dark, it's a damn good record, but with the exception of a few songs, it never really grabbed me in comparison with the symphonic metal I love, I probably overrated it a little back in 2013. Maybe it was the buzzy industrial effects that didn't always click or the songwriting that never quite came together, but Colours In The Dark very quickly fell into the category of being a record I really liked but not one I felt inclined to regularly revisit. Well, it became clear that Tarja wasn't slowing down, even in the lead-up to this release dropping a EP called The Brightest Void with songs that had to be cut from her newest record. Hell, it was practically an album in its own right, produced by Tarja herself and featuring the sort of eclectic elements that she'd never touched before, from the horns and harmonica that dominated 'Your Heaven And Your Hell' to the creaking piano-driven glitchy atmospherics on 'An Empty Dream' and 'Witch Hunt', and that's not counting the Paul McCartney deep cut or the symphonic metal cover of 'Goldfinger' that completely misses the point and isn't nearly as good as you'd hope. But whatever, that was an EP of extras - now that we have the full album, how is it? Well, if you were expecting Tarja to slow things down on her full-length release... yeah, that didn't happen, as this is easily her heaviest and most aggressive solo record of her career, to say nothing of her weirdest, with some twists that I don't even think her diehard fans will see coming. And yet, it works, better than I think the majority of people will give her credit - Colours In The Dark may have been the first definitive stake that Tarja was capable of holding her own as a solo artist, but The Shadow Self shows the sort of thematic cohesion and willingness to experiment and push her sound that makes her a tremendous force to be reckoned with entirely on her own merits. Now the first thing to note is that there is a bit of overlap between this record and The Brightest Void - both 'Eagle Eye' and 'No Bitter End' appear on both, albeit with superior mixes and the former featuring Red Hot Chili Peppers drummer Chad Smith contributing a solid if unexceptional drumline. And like with her previous few projects, there's a cover track, in this case of Muse's 'Supremacy' from The 2nd Law that's arguably worth the price of the album by itself. Now I shouldn't be surprised this song was incredible - the original 'Supremacy' was a great cut, but Tarja's operatic swell doesn't need the filters that Matt Bellamy needed to hit those even higher notes with weight, and she gives the song a much thicker roiling groove that's a fantastic fit for the symphonic bombast. And I continue to find myself amazed how much she's grown as a vocalist and performer, her vocal range and tone only getting clearer and more expressive, capable of belting like few others and yet also capable of stripping things back to gentler, ethereal acoustics like on 'The Living End', so she doesn't overwhelm the underlying compositions - and of course, the excellently layered symphonic multi-tracking does her a lot of favours. Unfortunately, it also means that her guest singers are placed at more of a disadvantage, and while I didn't mind Tarja's brother Toni showing up on 'Eagle Eye', I was a lot less of a fan of Arch Enemy's Alissa White-Gluz's growling vocals on 'Demons In You' - I didn't like it when she showed up on Kamelot's Haven, and I'm not wild about her here. Granted, she's less of a detraction than a distraction, because there's a lot going on that track and indeed on this entire album. These are easily some of Tarja's most layered and complex compositions to date, and considering how many strange directions this album goes, it's astonishing how well they hold together with consistently solid production, all of which came from Tarja herself. And so much of it works because she hits on a solid formula fairly early: anchor your primary melody in the prominent piano; supplement it with thicker rhythm guitars and the occasional solo that, yes, could be given a little more room to breathe; and then ensure you have stable grooves with thicker bass and propulsive drumwork that really has some potent crispness to stand out the symphonic backdrop. And building off that while never compromising the melodic motifs and hooks, it lets Tarja get away with a lot of riskier twists - forget the modern classical touches of 'Innocence', what threw me off-guard was the funk metal touches on 'Demons In You' - yeah, they don't stick around through the entire song, but they do add an off-kilter edge I'd love to see her explore more. Then you throw in the grinding touches in the guitars on 'No Bitter End', the distant bagpipes of 'The Living End', the ghostly trappings of 'Undertaker' that picks up some great grooves in the percussion, and the much rougher alternative metal guitar tones of 'Calling From The Wild' that builds to a monstrous groove, and you have a diverse but fascinating listen. And then there's the ramshackle nautical carnival on 'Diva' that is hard not to see as Tarja throwing down the gauntlet to Nightwish that she can match or perhaps even surpass them. Now I won't say all the production touches stick - there's an odd shrill brittleness on the edges and especially in the bridge of 'Love To Hate' which doesn't quite fit well against the awesome shift to a major key midway through, and some of the more buzzing elements on 'Eagle Eye' feel like remnants that could have been left back on Colours In The Dark - but really, those are minor. I should also mention that this record ends with 'Too Many', which features a hidden track after a few minutes that's a jumbled bit of genre experimentation - honestly, this record doesn't have the strongest ending, not quite able to sustain the fantastic momentum that comes before it. But now we need to talk about lyrics and themes - and in a sense, some of it is ground Tarja has examined before. Colours In The Dark was exploring the various shades of moral ambiguity, and The Shadow Self expands to find upon it with a personal touch, looking to examine the darkness within herself that Tarja uses to create her art. 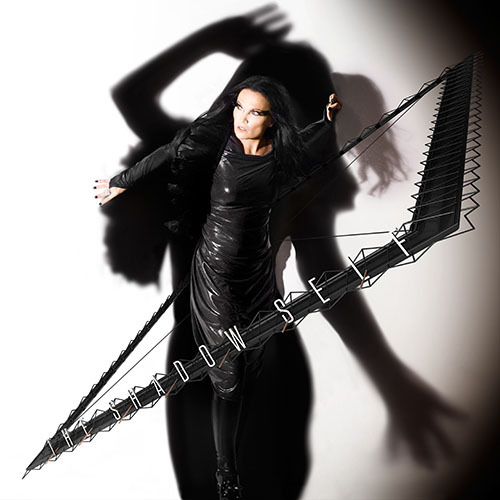 It's almost fitting that she got Chad Smith of Red Hot Chili Peppers, given these are analogous themes to lead single 'Dark Necessities', but Tarja expands the idea to go deeper. And what she finds is a much more openly passionate, commanding presence who isn't afraid to indulge raw ego, with the biggest example being 'Diva'. And yeah, as someone familiar with the drama that happened after Tarja left Nightwish, it's hard to go back through that song and not see it not just as a message to Tuomas, but also a reclamation of the label she'd been given in a pure moment of dark triumph. The cover of 'Supremacy' fits much in the same mold, as does the message to move on coming through on 'No Bitter End' and 'Love To Hate'. And yet it's telling how the record ends after so much indulgence in passion on lyrical sentiments that could almost be wistful, as Tarja having not just confronted her own dark passions wonders what might have been if she had been willing to set aside her own pride, the vice which she's all too aware is both her greatest strength and greatest weakness. Even though I'm not wild about 'Too Many', I really do love the line how she wishes she could 'break her pride for a moment in time' - set aside ego for one last memory, a moment of real poignancy that definitely lends what could be seen as an ego trip some deeper pathos and moral ambiguity. In short, while I didn't return to Colours In The Dark very often, I can definitely see myself going back to a fair few songs off of The Shadow Self a lot more. At this point Tarja has advanced as a singer, songwriter, and producer to impressive heights, and this is easily her strongest work, netting a solid 8/10 from me and definitely a recommendation if you're a fan of some kickass symphonic metal that dreams big and sticks the landing. And this point, I'd love to see where Tarja's darker passions might take her - if the music is this good, it'd be one hell of a journey.